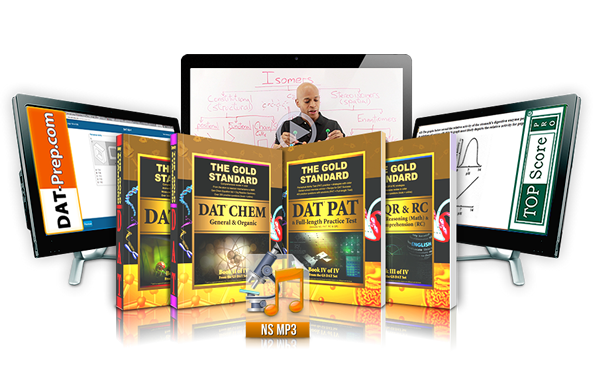 Your complete DAT package includes The Gold Standard DAT Complete 4-Book Set. With the books, you will receive a personal online access code which has the details of all sections you need to review for the DAT plus practice material and 2 full-length online DAT practice tests with detailed solutions. The DAT books have the total of 1408 pages and over 3000 practice questions in the books & online! The TopScore Pro includes digital review guide for the DAT including PAT, Reading Comprehension and Quantitative Reasoning; 3 Complete DAT practice tests, comprehensive detailed solutions, automatic scoring & diagnostic reports. Up to 7 months of online access from the activation date. Your DAT Complete Course also includes a comprehensive Gold Standard Natural Science video review (15 hours) for the DAT with CLEAR teaching. Our summary MP3 science reviews major points for the Natural Sciences (3 hours). MP3 files will be delivered by email within 1 business day. Science Review flashcards iPhone or Android app to help you review. Copyright 2019 DAT-prep.com. All Rights Reserved.